Atlanta tennis fans will get the dream matchup they hoped for as top-seeded and former Georgia Bulldog John Isner will take on one of Atlanta’s favorites in Andy Roddick in Saturday’s evening semifinal at the BB&T Atlanta Open. Roddick holds a 3-2 career head-to-head edge over Isner, who won the last meeting between the two last year in the semifinals at Winston-Salem. 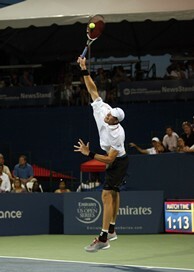 The only other win for Isner over Roddick came on one of tennis’ biggest stages in a thrilling third-round US Open night match on Arthur Ashe Stadium in 2009 with Isner eking out a five-set tiebreak victory. Roddick said after his straight-set quarterfinal win over American Michael Russell that he would have to rely on his big serve to beat Isner. "I will have to protect my serve against John," he said. "It’s not something you want to do but it’s something you have to do." He said he probably wouldn’t watch Isner’s evening match against Jack Sock. "But I’ve played them both before so I know what to expect," he said. The other semifinal will pit two Olympians and veteran ATP players against each other as 27-year-old No. 8 seed Go Soeda takes on 29-year-old world No. 63 Gilles Muller. It’s the first time the two have met. It will be Soeda’s second tour-level semifinal of the season, after beginning the year with a run to the Aircel Chennai Open final four where he lost to Serb Janko Tipsarevic. Muller, who hasn’t dropped a set in each of his first three matches in Atlanta, is bidding to win his first ATP World Tour title and is in his first semi in 2012. He is a two-time runner-up, with his last final appearance coming in Los Angeles nearly seven years ago. In the doubles semifinals, the top-seeded team of Colin Fleming and Ross Hutchins of Great Britain will take on the young team of Matthew Ebden, of Australia, and Ryan Harrison, of the United States, in the first semifinal while the evening semifinal pits Atlanta’s Donald Young and South African Raven Klaasen against Russell and Xavier Malisse.